Wooden Big Handle Shape Puzzle is a wonderful shape sorting puzzle with lovely big easy to grasp handles. 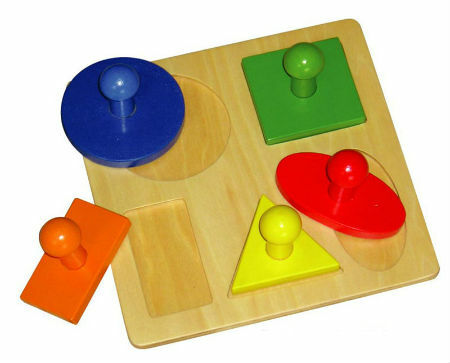 This five piece puzzle has different shapes in nice bright colors which have to be fitted into the base. This is a well made strong toy which is an ideal first puzzle for the very little. A great toy for fine motor skills and shape recognition. A puzzle that very small children will actually be able to do. Material: Wood childsafe paint, perspex, glass. We like this because: "Wonderful to have a puzzle that a little one can do all by themselves. "